Although a king, what form of government was Theseus supposed to have established at Athens? We've talked about this before, and I called shenanigans on the supposed answer. And when you get right down to it, I'd say that a lot of these kinds of stories about Theseus were not just shenanigans, but they were also something more: propaganda. Theseus delivering a beat down. With a club. Heracles was pretty stiff competition for anyone. But the Athenians -- they never settle for second best. 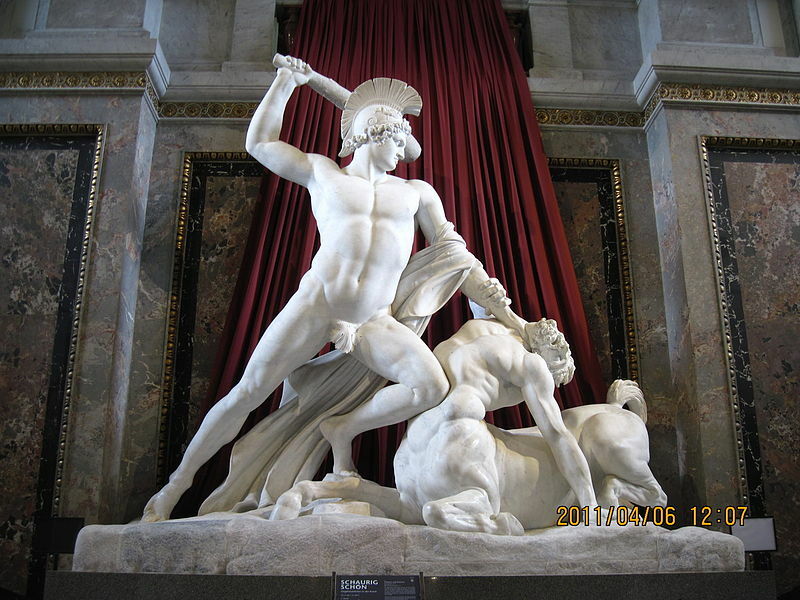 Instead, they made Theseus a companion to Heracles on some of his most famous journeys. In fact, that went ahead and made Theseus a companion to everyone on their most famous journeys. They sent him off with Jason after the Golden Fleece, with Heracles against the Amazons, they sent his sons to Troy, even though they had totally been deposed by Menestheus when Theseus was run out of Athens upon his return from the Underworld. They inserted Theseus into so many stories, that he became his own expression: Not Without Theseus. Meaning, nobody got anything awesome done without the ATHENIAN hero himself. Not even Heracles! So, Heracles had the 12 labors? Theseus had 6 of his own -- and conquered them before he'd even reached manhood! And!! After THAT, he liberated Athens from the subjugation of Minos by shipping out to Crete as tribute and killing the Minotaur. Yeah, okay, sure, maybe Heracles did kill snakes in his crib as an infant, but Theseus could have taken the easy route to Athens by sea, he didn't need a goddess to drive him into madness to become a hero, he made a deliberate choice to be all he could be! And he taught wrestling to the Greeks. And, he was so enlightened and just, he practically created DEMOCRACY! Heracles? pfft. He just whaled on people with his club. All he had going for him was crude power. Theseus had brains as well as a club! Because Theseus is nothing if not a reflection of the virtues of Athens. A shining example of everything the Athenians believed in. In other countries where the king sets up some additional governmental body to offer advice and maybe even make a few decisions on their own, while still remaining KING, himself, we don't call that a democracy. We call it a monarchy. In fact, Elective Monarchy might be the most fitting way of describing government in Theseus' day. And it wasn't special to Athens. In those days, nobody got to be king just because he was born a prince. Sure, it gave you a leg up, but if you didn't have the support of your people? Pfft. Even when you're Theseus, bringer of "democracy" and Hero of Attica. Well, by our current standards, there never was any real democracy in Greece. But we still have to credit them with getting the idea started. It's no secret that the Athenians thought they were smarter and better than everyone else. Obviously they needed a hero that was smarter and better than all the other heroes. I can't blame them. Personally, I've always preferred Theseus to all the other heroes anyway. He's just more my style. Theseus is definitely one of my favorites, too. He's a lot more interesting all around, and I never really cared that much for Heracles outside of Kevin Sorbo ;) But I also really like Pirithous! I have no problem with crediting LATER Athens with the idea of democracy -- I just think it is silly to say that it was Theseus who started it, still, today, when he was very much a Monarch. I suggest the Theseus-democracy thing is the usual interpolation by later generations. Plutarch was just pulling stuff from known legends. Watch any historical movie out of Hollywood and you'll see much worse. Theseus was at least one generation before Troy. The Iliad states point blank that a guy called Menestheus was king of Athens during the Trojan War. This in turn all happened in the Greek Dark Age, long before Solon wrote the first constitution. So when they dumped Theseus the Athenians merely swapped one king for another. Some time much later, probably hundreds of years later, the Athenians dissolved the kingship and replaced it with an oligarchy, which for day-to-day executive government selected three officials called the Eponymous Archon, the Polemarch and the Basileus. The three archon jobs were on a one year rotation. This slowly evolved in a very complex way into the world's first democracy, and that's precisely dated to 461BC, at least 800 years after Theseus. Menestheus was indeed king during the Trojan War -- after he was made king by Pollux and Castor, when they swept in to steal back Helen, whom Theseus had stolen, while he was down in the underworld with Pirithous. Of course you can make an argument that the whole Theseus-stealing-Helen to begin with was the Athenians forcing themselves and their hero into a story where he actually played no part at all, too. The story goes that upon Theseus' return from the Underworld (thanks to Heracles) the Athenians (then led by Menestheus, who had been appointed by *gasp* SPARTANS!) kicked him out and he went into exile, where he fell off his cliff. But Menestheus was some kind of relation to Theseus and I believe in the Iliad Demophon is specifically named as one of the Athenians at Troy, who is Theseus' son, and Demophon succeeds Menestheus as king of Athens, after. But I agree completely that it was later generations giving Theseus credit where credit was not due. I just think it's totally bogus that we're still giving that credit to him, all these years later, when we know precisely how democracy evolved in Athens! And how much later it actually occurred!